A review of Amit Trivedi’s new book, Riding The Roller Coaster -Lessons from financial market cycles we repeatedly forget. I was fortunate to listen to Amitji on March 1st 2015 at the Mumbai Investor Workshop. We were short of a speaker and Subra requested Amitji to speak on debt mutual funds. I am a fan of anyone who can objectively talk about investment risk. His talk was various risks associated with debt mutual funds and how to keep it simple. He has a calm and collected persona which shines through his work. Before we head to the review, I would like to point out that I rarely complete books. I just don’t have the attention span to do that. 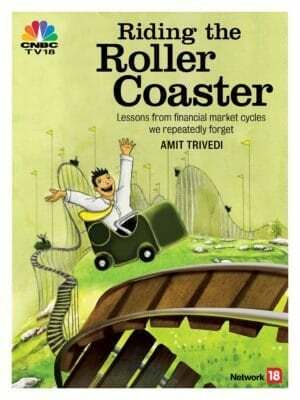 “Riding The Roller Coaster -Lessons from financial market cycles we repeatedly forget” is a book I completed because it is a compelling read. I also don’t know how to write a proper review. I am just going to cover the gist of the book and my experience reading it. “Lessons from financial market cycles we repeatedly forget” is an apt title. That is just what the book is about. Don’t feel the same way about ‘riding the roller coaster’. Don’t feel the same way about ‘riding the roller coaster’. There are too many books with that name or close variants. This is a book about greed. About asset bubbles, about market crashes and my favourite phrase in finance – investment risk. It is to the author’s credit that he has managed to convey a complex subject in simple, easy-to-understand language. It is a book meant for the retail investor to understand, compare and contrast the reasons behind the major stock market, bond market and commodity market crashes that we have seen so far. The book emphasizes the importance of being diversified at all times and avoid leveraged investing. The book can be divided into two parts. A series of past economic bubbles and past market crashes are discussed. I present below a brief snippet of each (Pictures here are provided for context, are from Wikipedia and not part of the book). For those who are not familiar with these economic bubbles, the book is the quickest way to understand the reasons behind the rise and fall. Tulip mania: In the 1630s, the Dutch started speculating on the price of Tulips bulbs. Tulip bulb contracts (promise to deliver) were changing hands at ever increasing prices without any actual deliverable in sight. It is believed that bubonic plague resulted in abrupt reduction in trading and bursting the bubble. “Tulip price index1” by JayHenry – Own work from data of Thompson. The south sea bubble In 1710, the South Sea Company was formed in England and claimed that it had a monopoly to trade with Spanish territories in the South seas. Investors gave up regular income from government bonds and exchanged them for company stock in the hope of rich and regular dividends. The company carried out no business, manipulated stock price and soon the price came crashing down. This is crash made popular by Benjamin Graham in the Intelligent Investor – the one in which Sir Isaac Newton lost a fortune. The 1920s was a decade of innovations and productivity. In order to participate in surging stock market, investors, including Ben Graham purchased stocks on borrowed money. When banks realized it was dealing with bad debt, it started selling shares which triggered the crash. The book details how Ben Graham quickly realized his mistakes and save his partnership from ruin. 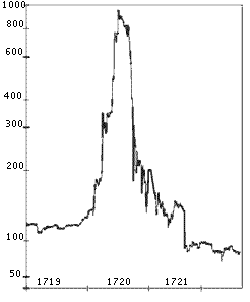 The Japanese Bubble when inflated real estate and stock prices came crashing down in 1990. If interested, you can read my study of Rupee Cost Averaging in a Sideways Market with the Nikkei. The Great Indian Securities Scam (1992) When Harshad Mehta became a broker in the debt market to finance his stock investments and started to misuse bank funds. How he jacked up stock prices with his definitions of ‘value’ in the early 1990s. The IPO Mania (1995) when investors were sold IPO application forms without any guarantee of allotment! The mania ended when IDBI deferred its IPO issue. This is a US Hedge fund which took on risky arbitrage positions driven by leverage. How Do Arbitrage Mutual Funds Work? Can You Think Of A Risk-Free AND Tax-Free Mutual Fund? Risky arbitrage?! An arbitrage opportunity carries minimal risk only when the underlying security being traded in different markets is the same! Amitji warned that such a danger could well be present with arbitrage mutual funds as well during the Mumbai meet. 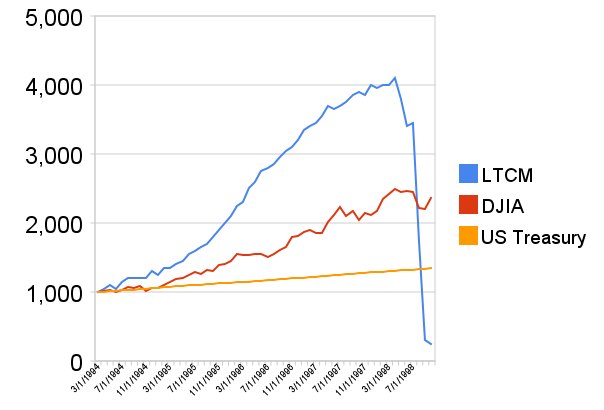 LTCM assumed the currencies of weaker and stronger European economies would converge in time. When Russian defaulted on its external and internal debt, the arbitrage spread widened and became larger than the cost of borrowing. The fund crashed. “LTCM” by JayHenry – Own work. The dot-com crisis When every dot-com company was believed to be the ‘next best thing’. The sub-prime crisis When it was believed (again!) that real-estate could never crash and bad debt was creatively structured as a high-rated bond. “Subprime mortgage originations, 1996-2008” by National Commission on the Causes of the Financial and Economic Crisis in the United States – Final Report of the National Commission on the Causes of the Financial and Economic Crisis in the United States, p.70 figure 5.2. This is the most delectable part of the book. 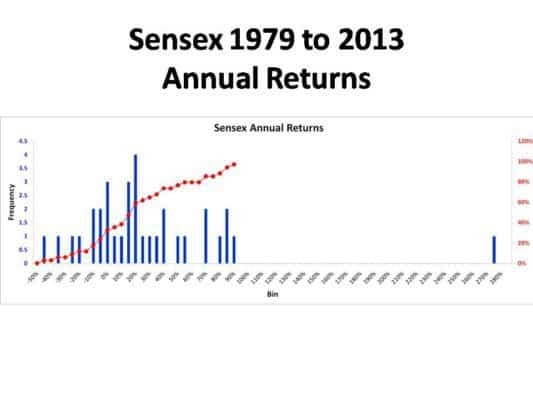 Given these crashes, Amitji goes about comparing and contrasting them to offer us patterns common to these economic bubbles: greed, leverage, ignoring basic notions of valuation, euphoria, a sense that this time it would be different! This part would appeal to everyone – those familiar with the crashes and those reading about it for the first time. I am sure that Amitji will include an account and analysis of this story in the second edition of this book. The book is as enjoyable as it is enlightening. I strongly recommend it.